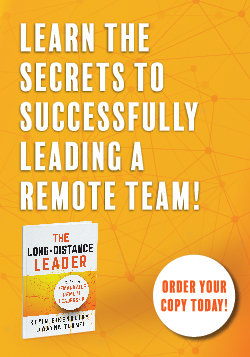 Virtual meetings are a fact of life for any leader who has remote teams or remote projects – and let’s face it, if you have just one employee who works outside of the office, you have a remote team! Over half a manager’s time is spent on meetings, and yet almost 2/3 of online meeting time is considered wasted. How can you hold online meetings that are productive, painless, and get the best quality work from your participants? In this powerful and interactive program, you'll learn simple rules and best practices for leading meetings that get results. You’ll learn how to speed up adoption of the tools you use, get more comfortable with their use and get a greater return on your technology investment. No matter the presentation platform, you’ll learn how to get the most from that tool and start leading meetings that get results! What good is saving money on time and travel if the meetings aren’t productive and build strong working relationships? Learn core leadership skills for the way we really work today. This 2-hour webinar workshop is a small group experience – the class size is capped at 10 participants to allow maximum interaction and learning. Course includes a tool to assess your current online meeting effectiveness, copies of the course visuals and a PDF, re-printable, packet of planning tools they can use in the future.